Irish Prime Minister Brian Cowen has said the cover-up by the Catholic hierarchy in Dublin of child abuse by priests was shocking and disturbing. A report revealed decades of abuse was concealed by the church in Dublin in an attempt to save its reputation. It said some senior police officers colluded in the cover-up. Mr Cowen said it was a crushing verdict that the good name and standing of the Church as an institution was placed above the basic safety of children. "Where this was facilitated by servants of the state, it was a betrayal of trust and a complete abandoning of duty," he said. "It is a savage irony that a policy of cover-up that may have been borne of a misguided effort to avoid scandal has shaken the faith and confidence of many people." 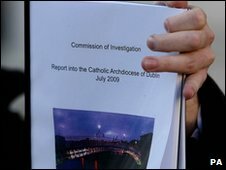 Released on Thursday, the Report of the Commission of Investigation into the Catholic Archdiocese of Dublin covered a period from 1975 to 2004. Some offending priests were shifted from parish to parish, leaving them free to abuse again. The Taoiseach said it was the Irish government's priority to ensure the highest possible standards of child protection, within the Church and elsewhere, and that perpetrators of abuse are brought to justice. "As to the implications for other individuals of the report's findings, I believe that just as there must be no ambiguity about the fact that all institutions and individuals are answerable to the law of the land, whatever their status, it is for those institutions and their members to determine the appropriateness of any individual to hold ecclesiastical office," he said. The report investigated how Church and state authorities handled allegations of child abuse against 46 priests made by 320 children. Eleven priests were convicted of sexual assaults on children.